Westlife (also initialised as W or WL) is an Irish pop vocal group, which formed in 1998 in Dublin, disbanded in 2012 and reunited in 2018. They were originally signed by Simon Cowell in the UK, Clive Davis in the US and managed by Louis Walsh and Sonny Takhar. The group currently consists of Nicky Byrne, Kian Egan, Mark Feehily, and Shane Filan. Simon Phillip Cowell is an English television music and talent show judge, A&R executive, businessman, talent manager, television producer, critic and entrepreneur. He has judged on the British TV talent competition series Pop Idol, The X Factor and Britain's Got Talent, and the American TV talent competition shows American Idol, The X Factor and America's Got Talent. Cowell is the principal, founder and chief executive of the British entertainment company Syco. The group rose to fame with their debut international self-titled studio album, Westlife (1999). It was followed by Coast to Coast (2000), World of Our Own (2001), Unbreakable – The Greatest Hits Vol. 1 (2002) and Turnaround (2003), which continued the group's success worldwide. Before the start of their Turnaround Tour in 2004, one of the original members, Brian McFadden, departed from the band. The four remaining members continued as a group to release their cover albums Allow Us to Be Frank (2004) and The Love Album (2006) and the studio albums Face to Face (2005) and Back Home (2007). After an almost one-year hiatus of studio recording in 2008, they regrouped and released the studio albums Where We Are (2009), and Gravity (2010) and the compilation album Greatest Hits (2011). After eight years, the quartet group will release their eleventh studio album, Spectrum , in 2019. Its first single "Hello My Love" was released on 10 January 2019 and its second single "Better Man" on 29 March 2019. Coast to Coast is the second studio album by Irish boy band Westlife. It was released on 6 November 2000 by RCA Records. Five hit singles were released from the album: "Against All Odds", "My Love", "What Makes a Man", "I Lay My Love on You" and "When You're Looking Like That". The album was a commercial success in both Ireland and the United Kingdom, selling 1.8 million copies in Britain alone. The album was the third-best selling of 2000 in Britain. World of Our Own is the third studio album recorded by Irish boy band Westlife. It was released through RCA Records on 1 November 2001. It reached number one in the United Kingdom and includes the singles "Queen of My Heart", "World of Our Own", "Bop Bop Baby", and the final single from the group's last album, "Uptown Girl". "Evergreen" was later covered by Will Young as his winner's single for the 2002 Pop Idol competition. It is their first album to have a title track. The band have sold over 40 million studio albums   and 55 million records overall worldwide. The band has received over a billion views on their official YouTube channel alone,  were streamed more than 300 million times,  and more than 550 million streams on Spotify as of 2018. They generated hit singles including "Swear It Again", "If I Let You Go", "Flying Without Wings", "I Have a Dream", "Seasons in the Sun", "Fool Again", "My Love", "What Makes a Man", "Uptown Girl", "Unbreakable", "When You're Looking Like That", "Queen of My Heart", "Mandy", "Tonight", "Hey Whatever", "You Raise Me Up", "Bop Bop Baby", "The Rose", and "World of Our Own". 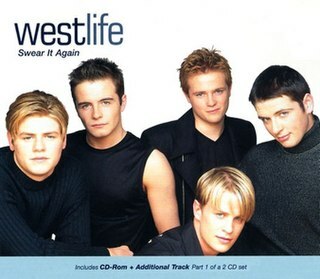 "Swear It Again" is a song by Irish boy band Westlife. It was released on April 19, 1999 in the United Kingdom, and on February 25, 2000 in the United States as the first single from their self-titled debut album Westlife (1999). This is the best-selling debut single of all-time from an Irish citizen. It peaked at number one in the UK Singles Chart for two weeks in May 1999. It moved to 182,000 units in the first two weeks of its release, and spent 13 weeks on the charts. This made it the first of fourteen UK number-one singles. To date, "Swear It Again" is Westlife's only single to have charted in the US, peaking at number 20 on the Billboard Hot 100 and ranking number 75 on the Billboard Hot 100 year-end charts, in 2000. The song was performed live on Miss Teen USA 2000. Louis Walsh, the manager of fellow Irish boy band Boyzone, came to know the group after he was contacted by Filan's mother, Mae Filan, but the group failed to secure a BMG record deal with Simon Cowell. Cowell told Walsh: "You are going to have to fire at least three of them. They have great voices, but they are the ugliest band I have ever seen in my life." Three members of the band (Lacey, Keighron, and Garrett) were told they would not be part of the new group, and auditions were held in Dublin where Nicky Byrne and Brian McFadden were recruited. In December 1999, a fourth and a double-side single was released, "I Have A Dream"/"Seasons in the Sun". It knocked Cliff Richard's "The Millennium Prayer" off the top spot and earned them the 1999 UK Christmas number-one single. It was the first official number one single music act in the 21st century of UK Singles Chart and also the last official number one single music act in the 20th century of UK Singles Chart. They are also the only music act to have four number one in UK Singles Chart in only a year. The fifth and last single from the album, "Fool Again", also peaked at number 1. With this, they broke records of being the only male band to have every single from their album reach number-one on the UK and the only male group with most original songs in an album that went straight to number one in the UK with four original singles. Afterwards, Westlife signed to Arista Records for the North American territory after auditioning for the label's founder, Clive Davis. Then the group had a promotional tour in the United States for their "Swear It Again" single and peaked at No. 20 in the Billboard Hot 100. An Asian tour followed in support of their debut album before releasing a second album. The group sold more than 12 million records in a span of three years during this time. They released their eleventh UK No. 1 single, "Unbreakable" in 2002. Amidst rumours of a split, Westlife released their first greatest hits album in November that same year titled Unbreakable - The Greatest Hits Vol. 1 , which zoomed all the way to No. 1 in the UK. The release was followed by the double A-side single "Tonight/Miss You Nights", which debuted at No. 3 in the UK. At this time, Because Films Inspire made a TV documentary titled "Wild Westlife", directed by Iain MacDonald and starred the group, featuring their daily life as musicians and their tour experiences. In 2003, Westlife went on their third world tour, The Greatest Hits Tour and invited to play at the annual Edinburgh Military Tattoo, shrugging off rumours of a split which is what most of the pop bands do after a Greatest Hits album. A recording of a concert from the tour, live from Manchester, was released in November 2002. In September 2003, Westlife released "Hey Whatever", which peaked at No. 4 on the UK Charts. Their fourth studio album, Turnaround , was then released in November, earning the group another UK No. 1 album. "Mandy", a cover of the Barry Manilow hit, was released in November 2003. Their version won them their third Record of the Year award, in under five years. Their version of "Mandy" is also considered the single with the longest leap to the top (from No. 200 to No. 1) in UK music history. "Obvious" was released as the final single from the album, charting at No. 3. On 9 March 2004, just three weeks prior to embarking on their fourth world tour, McFadden left the group to spend more time with his family and six months later to release solo music projects. On that day, a press conference was held where all the group's members were present, each giving emotional individual speeches. McFadden's final public performance as part of Westlife was at Newcastle upon Tyne's Powerhouse nightclub on 27 February 2004. McFadden attended the first day of the band's tour date as an audience. The last time the five had reunited in public was when McFadden acted in an Irish reality television show Anonymous where he disguised as a fan in an album signing event of the group in November 2005 and had a broadcast in January 2006. He subsequently began a solo career, and reverted the spelling of his first name back to its original 'Brian'. He released his first solo single, "Real To Me", which entered the UK chart at No. 1 and soon after, he released his first solo album Irish Son under Sony Music. McFadden later released more albums and singles, but only with moderate success. Less than a month after McFadden's departure, the group kicked off their "Turnaround Tour". A live version of "Flying Without Wings" from the said tour was released as an official UK download, earning them the first official UK Downloads number 1. A recording of a concert from the Turnaround Tour, live from Stockholm, Sweden, was released in November 2003. In September 2004, they performed on the World Music Awards, where they were recognised as the Best Irish Act of that year. They then released a Rat Pack-inspired album and fifth album ...Allow Us to Be Frank , which peaked at No. 3. No singles from this album were released in the UK. "Ain't That a Kick in the Head? ", accompanied with a music video, was released as a physical single in other European countries. "Smile" and "Fly Me to the Moon", both with music videos as well, were released as digital downloads only. Prior to the release of the ...Allow Us to Be Frank album, Westlife scouted for "the perfect fan" to help promote their album. After X Factor -style auditions, they found Joanne Hindley, who recorded "The Way You Look Tonight" with the group. To mark this special collaboration, a special programme was televised, showing auditions and live performances, called She's The One, presented by Kate Thornton. It also featured a live performance by their fathers with their version of "That's Life". Westlife continued to tour Europe as part of their "The Number Ones Tour" which started in early 2005. The tour at ranked at number 84 worldwide with top concert tour ticket sales with 191,361. A recording of a concert from the tour, live from Sheffield, was released in November 2005. On 5 November 2007, Westlife released their eighth album, Back Home , which contained nine new original songs along with three cover songs. The album debuted at No. 1 on the UK Music Charts and it was also 2007's fifth biggest selling album in the UK. The first single released from the album was a cover of Michael Bublé's "Home", which peaked at No. 3 in the UK. "I'm Already There", not released as a single, managed to chart in the UK based on downloads alone, following a performance on an episode of The X Factor UK. On 15 December 2007, they had a two-hour show called The Westlife Show where they performed 10 of their songs, some of which were voted online by fans and some from Back Home. It was hosted by Holly Willoughby. Months later, "Us Against the World" was announced and released as their second single in UK and Ireland. Before the release of the second single, they embarked on the Back Home Tour on 25 February 2008. This tour marked the first time that the group had travelled and performed in New Zealand, performing four sold-out shows in Auckland, Wellington, New Plymouth and Christchurch. Meanwhile, "Something Right" was released as the second single and "Us Against the World" became the third single in Europe and the Asia Pacific region. Both songs performed well on several music charts. From 2005 to 2008, Music Week revealed on their website that Westlife was the official third top touring act within the years while they were the seventh top touring act of 2008. On 28 March 2008, after 27 sell-out shows, in the space of 10 years and have sold 250,000 tickets. All four members were presented with a plaque cast of their hands, which can also be seen in the Wembley Square of Fame similar to Hollywood Walk of Fame. Then to mark their tenth year in music, Westlife staged a special 10 Years of Westlife, a sold-out concert at the world's thirty-third biggest and Europe's fourth biggest stadium,  Croke Park, on 1 June 2008.  which Egan described to be a "pop extravaganza". It was only the second time for an Irish act to headline the stadium after U2. Filan confirmed that a corresponding live concert DVD would be released. The group announced that they would be on hiatus for a year after their Back Home Tour  and that there would not be an album release in 2008 as they would be spending more time on the production of their tenth album. As promised, the group's official website confirmed on 27 September 2008 the release of a DVD on 24 November 2008 entitled 10 Years of Westlife – Live at Croke Park Stadium which went straight to No. 1 on UK, Ireland, South African, Hong Kong and New Zealand Music DVD charts. As the group ended another successful tour, Walsh announced in the show Xpose that 1 July 2008 would be the official start of the longest hiatus of the group. He said that it will be a one-year break, from that day up to 1 July 2009. On 13 December 2008, while on a break, Westlife made an unexpected appearance during that year's X Factor final where they performed "Flying Without Wings" with runners-up JLS. After the performance, Filan and Byrne were interviewed on The Xtra Factor with Boyzone's Keating and Stephen Gately. As JLS also performed, "I'm Already There", Westlife's version of the song re-entered the UK Singles Chart at No. 63 while a new entry on Ireland Singles Chart at No. 47 due to extensive downloads only. In the last week of January 2009, a DVD entitled The Karaoke Collection was released. This is the first time Sony Music has released an official Karaoke disc for music videos in DVD format. In 27 February 2009 issue of Herald Ireland , Walsh revealed that Cowell had already picked three new songs which he believed would be instant hits. On 18 March 2009, Westlife won the Best Irish Pop Act on the 2009 Meteor Awards for the ninth consecutive time. Their tenth album, Where We Are , was released on 30 November 2009 in the UK and peaked at No. 2 on both Irish and UK Albums Charts. The new single, "What About Now", was released a few weeks earlier on 23 October 2009, with digital downloads being available the day before. The said single peaked at number 2 on both Irish and UK Singles Chart and ranked number 85 in the year-end official sales chart. Daughtry's original version of the song gained exposure on the audition rounds of The X Factor prior to Westlife's release. They were also part of the Haiti charity single in early 2010 with, "Everybody Hurts", an R.E.M. cover which was organised by Cowell. The tour in support of this album was called, "The Where We Are Tour". The tour entered at number 50 of top concert tour for the third quarter of the year with 241,865 ticket sales. A recording of a concert from the tour, live from London, was released in November 2010. The eleventh album was recorded and processed with songwriter and producer John Shanks in London and Los Angeles and was entirely produced by Shanks. On 14 November 2010, the single "Safe" was released. It debuted on the UK Singles Chart on 21 November at No. 10, giving the group their 25th Top 10 single in the United Kingdom. The new album titled Gravity was released on 22 November 2010. It went to No. 1 in Ireland and No. 3 in the UK. Westlife was named the fourth most hard-working music artist and third most hard-working band in the UK by PRS in 2010. Also from the said year Billboard compiled the top international touring acts worldwide, the group ranked 14th with $5,104,109 estimated net take of tour grosses (assuming a typical 34% artist cut after commissions and expenses). In March 2011, they started their eleventh major concert tour, the Gravity Tour. This tour marked the first time the group travelled to Oman, Namibia, Guangzhou and Vietnam for concerts. During this time, the Official Charts Company compiled the band's chart history which states that other than their number-ones they had, 25 UK Top 10s, 26 UK Top 40s, 27 UK Top 75s, 20 Weeks at Number 1, 76 Weeks in Top 10, 189 Weeks in Top 40 and 282 Weeks in Top 75 in the UK Singles Chart. While 7 Number 1s, 12 UK Top 10s, Top 40s, Top 75s, 7 Weeks at Number 1, 92 Weeks in Top 10, 189 Weeks in Top 40, and 299 Weeks in Top 75 in the UK Albums Chart. They also had seven album number-ones in eight years. The most number ones with different albums by a music album act, group, pop group, and male group in UK Albums Chart in the 2000s and the second most number ones, tied with Rod Stewart, with different albums by a music album act, group, pop group and male group in UK clustered per decade since The Beatles in the 1960s. Third highest band, and highest pop band with most number ones and top tens in UK Singles Chart. They have fourteen number-one singles in eight years and seven number-two singles in ten years and in seven consecutive years. They are also the pop group and act, Irish group and act, and male group and act with most number-one singles with all and most members are still living. Runner-up to Beatles with most number one hits with an individual credits by bands, and male bands. Most number one hits with an individual credits by non-British bands. Runner-up to Beatles with most top 3 hits by a group and a male group. Runner-up to Take That with most consecutive top 3 hits by a group and a male group. Most consecutive top 3 hits including debut single by a male group and tied with Spice Girls for the act, group, pop act and pop group categories. Most consecutive top 5 hits of all-time in the UK by a debuting act and group and by an act, a group, a male group, a pop act and a pop group. Runner-up to Madonna with most consecutive top 10 hits of all-time in UK. They have the most consecutive top 10, top 20, top 40, and top 75 hits by a debuting act and group, and by an act, a group, a male group, a pop act and a pop group in UK. They are the top act, group, pop act and pop group from Ireland in the UK Singles and Albums Charts best-selling music artists lists after U2. Since the split the four lads have released albums and singles individually. Filan, with three studio albums and with singles and tours (with support act dates for Lionel Richie) released and a Top 5 hit album in UK. Feehily associated with an independent record label (which he is the co-director) and released albums and singles. He also made it as a supporting act to Mariah Carey and Wet Wet Wet. Egan was voted King of the Jungle in ITV's I'm a Celebrity 2013 series, released one studio album with singles, was a coach judge in The Voice of Ireland, and been a support act for Boyzone. Byrne released one studio album, joined Strictly Come Dancing UK, hosted several major Irish television and radio shows, and represented Ireland in Eurovision with the song which was also his debut solo single. They were also seen in public events by twos, Filan and Feehily, Byrne and Egan, Egan and Filan, Byrne and Filan, Feehily and Byrne, Egan and Feehily. With all of them released albums and singles individually and had an actual charting in the UK Singles and Albums Charts, the feat made the band and its members the most successful music and pop music artists from a band and a pop band in the UK number-one singles and albums charts after The Beatles. On 3 October 2018, Ken Sweeney of The Irish Sun reported that the band will officially announce their comeback online sometime that day. At exactly 8 pm (GMT time), the same day, the group formally announced that there'll be new music and a tour coming soon on their official social media accounts like on their newly created Instagram. Their reunion story caused huge fan reaction worldwide. According to the reports, they had been preparing for their comeback for the past year of 2017 as Feehily had said on the same year that he hoped to get them all together for a proper catch-up. It was later revealed that Egan and Filan first talked about their reunion when Adele released "Hello" in late 2015. While Byrne raised his concerns about “...where Westlife’s music fits into the current market” and not wanting to be simply a “nostalgia” act. He went on to say, "While we were away, we realised what Westlife really meant to the fans — and to us." McFadden was not involved in the reformation as he said on an interview with Closer Magazine , "...there's no reason for me and the boys to stay buddies." and "For me, it was just a job. I only met the guys when I joined the band and have no regrets about leaving." Their first live interviews and press conferences as a four-piece in six years were made 20 days later held in Dublin and Belfast where they revealed their plans to stick around longer. Days later, it was followed by several radio interviews in Manchester, Ulster, Dublin and Glasgow. Walsh also said in separate interviews that the most important things now are the songs, it will be featured as an introduction to their new sound and added, "I was just waiting for them to decide when. There were record deals on the table, but the icing on the cake was Ed Sheeran writing these amazing songs for them, as well as having Steve Mac, who produced their early songs, on track too." [...] "Sheeran's input adds a contemporary edge", "I've heard the first two songs and they are just incredible." Mac and Sheeran have come up with four new tracks for them and one is an uptempo anthem. One will be a single co-written by Sheeran. Some had been composed since 2016. The duo have co-written recent hits like the most streamed song on Spotify, "Shape of You", and also "Woman Like Me" by Little Mix, and "Thursday" by Jess Glynne. Mac revealed the band's signature sound will be back. Feehily and Filan added, "We’re not trying to change Westlife’s sound, we’re trying to evolve", "We need to be a Westlife 2.0, a better version of ourselves. We wanted to come back and recreate Westlife’s sound, but better, and be a better band, and the most important thing about any band is music." In November 2018, Byrne expressed 2019 will be "one hell of a year"  and Walsh added that the band will be back in recording studios in January 2019 but in December 2018, it was found out that the group was working with Daniel Davidsen and Peter Wallevik. Both have worked with Michael Learns to Rock, Why Don't We, Olly Murs, and Kylie Minogue. Wallevik also posted names of people the band are working with like JC Stewart, Jordan Thomas, and Ed Drewett (One Direction, The Wanted, Jonas Blue). They are also working with Carl Falk (Madonna, Avicii, Nicki Minaj, The Vamps, Carly Rae Jepsen, Demi Lovato), Fraser Churchill and James Bay. On 19 December 2018, Egan and Feehily posted a picture of the group's first rehearsals together in six years and Egan added that "2019 will be nothing but epic". A documentary film about them and their reunion will be published by Netflix later this year but the band later denied that it was true. The pop group's first official music cover in more than seven years for their single, "Hello My Love". "Hello My Love",  their first single since 2011 was released on 10 January 2019. It was released in four official versions: Original, instrumental, acoustic, and a remix. Their first UK, worldwide television and recorded professional appearance, performance in seven years and of the single was on The Graham Norton Show on 11 January 2019 where it was tagged as "one of the most highly-anticipated TV comebacks of the decade". They also performed the single on the 24th National Television Awards on 22 January 2019 and it was their first live television performance, first The O2 Arena and arena performance together in seven years. Their first Irish performance and television appearance together was in the finals night of Dancing With the Stars on 24 March 2019. Their first tour and first promotional tour in general and for a single release together outside UK and Ireland in seven years was on Singapore on 29 January 2019 to 1 February 2019. It reached number-two in Ireland and Scotland. It is their highest charting on their official singles charts since the band's "What About Now" single in 2009, ten years ago. The full-length album will be released in 2019, it will be their eleventh studio album, their first album to be released in eight years and first studio album in nine years. In November 2018, the pre-order links for the upcoming album were released on Amazon Australia,  Japan,  UK,  and HMV. The album is titled Spectrum . Follow-up second single, also by Mac and Sheeran with Fred Gibson (George Ezra, PRETTYMUCH, Rita Ora), was called "Better Man". This is their second number-one hit in the UK Singles Physical Chart and number-two in UK Singles Sales Chart and Scottish Singles Chart in 2019 and in 2010s decade. The single is their 29th Top 10 hit in Ireland and 28th Top 40, and 29th Top 75 hit in the United Kingdom. On the evening of 17 October 2018, the UK and Ireland dates of their latest tour were announced through Westlife's social networks and was called The Twenty Tour. A pre-order site of the forthcoming new Westlife album, for both unsigned and limited signed (which was taken down minutes later) from their official store was cited where fans will receive an exclusive pre-sale code for early access tickets to the 2019 tour. Pre-sale tickets were all sold out before the general sale and the event had been described as a "big one"  making the original tour dates sold out at the very time of its general sales opening. The tour had twelve original dates and fourteen more dates added on places like Liverpool, Leeds, and Sheffield in less than seven hours due to phenomenal huge demand as per ticket promoters. On their first full print interview as a band in six years, they said: “We will get to everyone eventually.” Egan added, “Every country that wants to see Westlife will see us at some point. We won’t step away from this until we’ve managed to tour the world.”  The second, third, fourth and fifth rounds of general sale of tickets were opened on 15, 23 November, 7, 14 December 2018 for newly added dates for Belfast, Cardiff, Glasgow and Manchester. Ten additional Asian dates (Thailand, Macau, Taiwan, two in the Philippines, three in Indonesia, two in Malaysia and in Singapore) were announced in 21 March 2019 with general ticket sales opening from 28 March to April 2019. The said tour has a total of forty-four dates and is set to take place on some of Asia's and Europe's largest indoor arenas and stadium so far. The second day of the tour in Croke Park will have a live film broadcast in selected cinemas in at least eleven European countries in 6 July 2019. They hired the Cirque du Soleil team for the production, stage design, and routines of the tour. Celebrities including Elton John, Sharon Osbourne, Chris Martin of Coldplay, Jamie Vardy, Mike Tyson, Martine McCutcheon, Niall Horan, Neil Murillo, Leona Lewis, CJ Stander, Daniel Bedingfield, Ed Sheeran, Rebecca Ryan, Emily Atack, Calvin Harris, Sam Mangubat, Stormzy, Sofie Hagen, Gemma Collins, Matt Kilgallon, Shona McGarty, Alexandra Burke, Harry Styles, Michael Devlin, Scott McKenna, Ed Drewett, Dominic Ball, Dan Osborne, Union J, James Arthur, Zhong Chenle and Robert Pattinson have recognized their love for Westlife's music. Some well-known music artists like Ronan Keating, Will Young, Shayne Ward and Ruben Studdard have also covered their songs. Some of the following are original songs by Westlife that have been covered by other artists (which includes professionally recorded or performed list only). Some were officially released as a single. I Wanna Grow Old With You Lazard and Muzzy G.
Despite their popularity, some artist have expressed their dislike to the group like Eminem, Christina Aguilera, Bob Geldof, Pierce Brosnan, Liam Gallagher, Melanie C, Victoria Beckham, Gary Barlow, Damon Albarn and Noel Gallagher. Some have also criticized the band for having lots of covers, having the same sound on every albums released, lack of use of musical instruments and lack of songwriting skills. Feehily revealed in 2009: "There were many songs which I would be even scared to mention, you know, that were suggested to us which we turned down. "There were many cover versions and many original songs that were either terrible. There was loads of stuff through the years, like 'You Are Not Alone' by Michael Jackson?, that were suggested by their record company chief Cowell". Westlife have proven to have more original songs, worked with many songwriters and music producers and co-written numerous songs throughout their career. (See Westlife songlist for the compilation.) Band members can also play at least one musical instrument and Egan can play up to five musical instruments and a grade eight pianist. They have participated in a Royal British Legion poppy appeal and did an advertisement for Galway's Irish Water Safety campaign. They also lent their support to the Irish Blood Transfusion Service (IBTS). On 4 November 2005, they performed with other music artists at Coca-Cola Dome in Johannesburg, South Africa for The "Unite of the Stars" Gala Banquet charity concert that supports four charities: the Nelson Mandela Children's Fund, Unite Against Hunger, St. Mary's Hospital and the Topsy Foundation. They also performed live for charity on Sport Relief,  Macmillan Cancer Support,  Croí, Western Alzheimer's, O’Dwyer Cheshire Home, Mayo Cancer Support Group, Marie Keating Foundation,  Outward Bound Trust,  ChildLine, Children in Need, Sheffield's Children Hospital. They had also helped for auctions on Meningitis Research Foundation,  Carlton Celebrity Auction for Centrepoint (for the homeless),  the National Society for the Prevention of Cruelty to Children, and The Samaritans),  Zutto charity painting, Pushing The Envelope (for National Literacy Trust). They've visited also Great Ormond Street Hospital. They've been involved also with the following organizations: Royal National Institute for the Deaf (RNID),  Cancer Research UK, United Nations' World Food Programme (WFP),  Muscle Help Foundation,  Global Breast Cancer Awareness Campaign  and Real Man campaign. They are also included as ambassadors of The Irish Society for the Prevention of Cruelty to Children (ISPCC). As part of IPSCC, Feehily signed up for their anti-bullying campaign, "Join the Fight for Children's Rights". and Aware,  Byrne for Heart attack and Asthma awareness campaigns, Daily Star's Reclaim Our Streets crusade,  Byrne for Oxfam's East Africa famine appeal (by Celtic F.C. v Manchester United F.C. football match),  and for Children's Hospice South West (by Truro charity football match). Filan, Byrne for Soccer Aid,   J.P. McManus Invitational Pro-Am, One World Beat. Filan for Irish Red Cross (by Sligo Rovers F.C. Showgrounds football match),  and Egan for Strandhill Indonesian Relief Fund (SIRF, in aid of the South Asian tsunami victims). Shane Steven Filan is an Irish singer and songwriter. He is one of the two lead singers and frontman of boy band Westlife, which was formed in 1998, disbanded in 2012, and regrouped in 2018. Westlife has since released twelve albums, embarked on twelve world tours, and won several awards, becoming one of the most successful musical groups of all time. "Bop Bop Baby" is a song by Irish boy band Westlife and it was released on 20 May 2002 as the third single from their third studio album World of Our Own (2001). The single peaked at number five on the UK Singles Chart. However, during an interview, the band claimed this was due to the obscure choice of single, as they would have much preferred to release "Why Do I Love You" - and had even recorded a video for it. It is the band's eighteenth best selling single in paid-for sales category and in best selling single combined sales category in the United Kingdom as of January 2019. "Tonight"/"Miss You Nights" is a song by Irish boy band Westlife. It was released in the on 6 January 2003 as the second and final single from their first compilation album Unbreakable – The Greatest Hits Volume 1 (2002). It was released as a double A-side in the UK, but in some other countries, the songs were released separately with an emphasis more on the "Tonight" release. "Safe" is a song by Irish pop group Westlife from their tenth and final studio album Gravity (2010) and this pop rock ballad was released on 14 November 2010 as the album's lead and only single in the United Kingdom. It was written by John Shanks and James Grundler, and the single version was produced by Shanks, Richard "Biff" Stannard, and Ash Howes. This song is the group's last physical single under the tutelage of Simon Cowell, having left Syco and Cowell in March 2011. "Safe" debuted at number four in Ireland, becoming their twenty-fifth top ten single. It charted at number ten in the UK. The song was featured in the 2011 movie Dolphin Tale starring Ashley Judd and Morgan Freeman. "Lighthouse" is a song by Irish boy band Westlife and it is the lead single from their second compilation album Greatest Hits (2011). The song is their final physical single after their announcement to disband prior to their 2018 reformation. Also the single is the group's first and last physical single not under the tutelage of Simon Cowell, having left Syco and Cowell in March 2011. The song was written by Gary Barlow and John Shanks, and was released on 11 November 2011. A music video was filmed in South Africa and premiered on 20 October 2011. "Hello My Love" is a song by Irish pop vocal band Westlife. It was released on 10 January 2019 as the lead single from the band's eleventh studio album, Spectrum, and is their first single to be released under Universal Music Group and Virgin EMI Records. It is also their first official single in eight years since the release of their last single, "Lighthouse", in 2011. The song is written by Ed Sheeran and Steve Mac. Mac had written the band's number-one hits like "World of Our Own" and "Flying Without Wings", while this being the first song released by the band written by Sheeran. It is the biggest selling and streamed single on Ireland by a group, pop group, and an Irish group so far of 2019. Fourteenth overall so far since April 2019. It reached number-two in Ireland and Scotland, it is their highest charting on their official singles charts since the band's "What About Now" single in 2009, ten years ago. The single stayed at number-one for two weeks in the UK Physical Chart, the group's highest charting since their 2006 single, "The Rose". "Better Man" is a song by Irish pop vocal band Westlife. It was released on by Virgin EMI Records on 29 March 2019 as the second single from the band's eleventh studio album, Spectrum. The song was written by Ed Sheeran, Fred Gibson and Steve Mac. This is their second number-one hit in the UK Singles Physical Chart and number-two in UK Singles Sales Chart and Scottish Singles Chart in 2019 and in 2010s decade. The single is their 29th Top 10 hit in Ireland and 28th Top 40, and 29th Top 75 hit in the United Kingdom. Spectrum is the upcoming eleventh album by Irish boy band Westlife, scheduled to be released on 6 September 2019 through Virgin EMI Records. It will include the singles "Hello My Love" and "Better Man", and feature collaborations with Ed Sheeran and James Bay. ↑ McHugh, Connell (26 September 2018). "Westlife set for major comeback at Croke Park in summer 2019". Irish Mirror. ↑ "Westlife to perform at Logies". The Australian . April 18, 2008. Retrieved May 12, 2018. ↑ "Belfast goes crazy for Westlife". Belfast Telegraph . May 3, 2010. Retrieved May 12, 2018. ↑ "Gillian Filan, wife of Westlife's Shane, declared bankrupt – just SIX years after his own financial collapse". Daily Mirror . August 4, 2018. Retrieved August 4, 2018. ↑ Indonesian Idol (5 March 2018). "SHANE FILAN – HEAVEN – Spekta Show Top 7 – Indonesian Idol 2018" – via YouTube. ↑ "PressReader.com - Connecting People Through News". www.pressreader.com. ↑ Benett, Dave. "Westlife Party". Getty Images UK. ↑ "UK Irish Embassy honours Westlife". Irish Examiner. ↑ "Top-selling album act of the 21st century in the UK". ↑ "Certified Awards". Bpi.co.uk. Retrieved 4 March 2019. ↑ "The Official Top 20 biggest selling groups of all time revealed!". Officialcharts.com. Retrieved 6 April 2014. ↑ Myers, Justin (9 November 2018). "Acts with the most Number 1 albums on the Official UK Chart". Official Charts Company . Retrieved 31 January 2019. ↑ "Official Singles Charts' biggest selling artists of all time revealed". Officialcharts.com. Retrieved 6 April 2014. ↑ "Westlife – Artist Insights – YouTube". ↑ "Westlife – About". 25 September 2018 – via YouTube. ↑ "Westlife Announce 'The Twenty Tour'". Officialcharts.com. Retrieved 2018-10-18. ↑ "Westlife manager tells it straight". 29 October 2001 – via news.bbc.co.uk. ↑ Cowell, Simon (2003). I Don't Mean to Be Rude, But... Broadway Books. ISBN 0-7679-1741-3. ↑ Bower, Tom (2012). Sweet Revenge: The Intimate Life of Simon Cowell. Random House Publishing Group. ISBN 034553395X. ↑ "Welcome Westside 1998". RTE. ↑ Inc, Nielsen Business Media (5 February 2000). "Dublin Darling Westlife Wins Over Europe, Aims For Success in U.S." Billboard– via Google Books. 1 2 3 4 "Westlife on GMTV". GMTV. Archived from the original on 27 December 2007. Retrieved 22 December 2007. ↑ Inc, Nielsen Business Media (5 February 2000). "ACTUAL ARTICLE TITLE BELONGS HERE!". Billboard– via Google Books. ↑ "Record-Breakers and Trivia – Albums". everyhit.com. ↑ "Scottish Albums (14 January 2001)". Official Charts Company . Retrieved 17 February 2013. ↑ "Westlife, Shania Top UK. Christmas Charts". Billboard. 20 December 1999. Retrieved 22 December 2007. ↑ Sexton, Paul (10 January 2000). "Westlife Tops UK Singles Chart For 4th Week". Billboard. Retrieved 22 December 2007. ↑ Sexton, Paul (3 April 2000). "Westlife Go Five For Five on UK Singles Chart". Billboard. Retrieved 22 December 2007. ↑ Taylor, Chuck (5 February 2000). "Dublin's Darling Westlife Wins Over Europe, Aims For Success In U.S.". Billboard . Nielsen Business Media. 112 (6): 110. ISSN 0006-2510. ↑ "Radio Concert Monitor | Professional Journal archives from". AllBusiness.com. Retrieved 13 October 2011. ↑ "Westlife Outlasts Spice Girls in UK Chart War". Billboard charts. 13 November 2000. Retrieved 22 December 2007. ↑ "Platinum Awards". British Phonographic Industry. Archived from the original on 27 December 2007. Retrieved 22 December 2007. ↑ "Westlife Defy The 'Odds' On UK Singles Chart". Billboard charts. 25 September 2000. Retrieved 22 December 2007. ↑ "Westlife Continues UK Singles Chart Monopoly". Billboard charts. 6 November 2000. Retrieved 22 December 2007. ↑ Inc, Nielsen Business Media (18 November 2000). "ACTUAL ARTICLE TITLE BELONGS HERE!". Billboard– via Google Books. ↑ "Bob The Builder Ends Westlife's UK Chart Run". Billboard charts. 26 December 2000. Archived from the original on 27 December 2007. Retrieved 22 December 2007. ↑ Senior, Raymond. "ShowBiz Ireland – Westlife survive earthquake in Mexico". showbiz.ie. ↑ "The Irishness of Irish Music". ↑ "Billboard 11 Aug 2001". ↑ "Westlife Honoured with Freedom of Sligo 2000". rte.ie. ↑ "Out of the Darkness". ↑ Sexton, Paul (12 March 2001). "Westlife Return To Form on UK Singles Chart". Billboard charts . Retrieved 22 December 2007. ↑ Sexton, Paul (12 November 2001). "Westlife, Steps Top UK Charts". Billboard charts . Retrieved 22 December 2007. ↑ Sexton, Paul (19 November 2001). "Boy Bands Crowd UK Charts". Billboard charts . Retrieved 22 December 2007. ↑ "Westlife, 1,000,000 sales award". whytes.ie. ↑ "Westlife of luxury; POP STARS ARE NO7 ON YOUNG RICH LIST. – Free Online Library". thefreelibrary.com. ↑ Chua, Jonathan (17 November 2002). "Unbreakable: A fitting title for the Westlife". Philippine Star . Retrieved 22 December 2007. ↑ Sexton, Paul (11 November 2002). "Westlife, Blue Top UK Charts". Billboard charts . Retrieved 22 December 2007. ↑ Sexton, Paul (31 March 2003). "Linkin Park, Room 5 Crash into UK Charts". Billboard charts . Retrieved 22 December 2007. ↑ "BFI | Film & TV Database | WILD WESTLIFE (2002)". Ftvdb.bfi.org.uk. 16 April 2009. Retrieved 13 October 2011. ↑ "Westlife: The Greatest Hits Tour (2003)". Yahoo Music. Retrieved 22 December 2007. ↑ Sexton, Paul (22 September 2003). "Darkness, Black Eyed Peas Lead UK Charts". Billboard charts . Retrieved 22 December 2007. ↑ Sexton, Paul (1 December 2003). "Young, Westlife Top UK Charts". Billboard charts . Retrieved 22 December 2007. ↑ "Record Breakers and Trivia: Singles: Individual Hits: Number 1s". EveryHit. Retrieved 21 March 2008. ↑ "WESTLIFE SPLIT – OFFICIAL – NME". 9 March 2004. ↑ "Boy-band Westlife become foursome". BBC News. 9 March 2004. Retrieved 22 December 2007. ↑ "Westlife – Greatest Hits Tour ". Amazon UK. Retrieved 22 December 2007. ↑ "Real To Me by Brian McFadden". Yahoo! UK. Archived from the original on 7 October 2007. Retrieved 22 December 2007. 1 2 "Study: U.K. Arena Attendance, Ticket Sales Up". ↑ "Westlife top first download chart". BBC. 1 September 2004. ↑ "Westlife She's the One (2004)". BFI. 16 April 2009. Retrieved 13 October 2011. ↑ "Westlife She's the One (2004)". ↑ "Pollstar – Welcome to the New Pollstar!" (PDF). pollstarpro.com. ↑ "Westlife: I'm with the brand". independent.co.uk. ↑ "Westlife celebrate chart double". BBC News. 7 November 2005. Retrieved 22 December 2007. ↑ Sexton, Paul (31 October 2005). "Westlife, Robbie Williams Top UK Charts". Billboard charts . Retrieved 22 December 2007. ↑ Sexton, Paul (19 December 2005). "Obscure Duo Nizlopi Tops UK Singles Chart". Billboard charts . Retrieved 22 December 2007. ↑ Sexton, Paul (27 February 2006). "Madonna, Jack Johnson Take Lead on UK Charts". Billboard charts . Retrieved 22 December 2007. ↑ "China youth prefer Westlife to politics". NineMSN. 17 July 2006. Archived from the original on 21 February 2012. Retrieved 23 December 2007. ↑ "Live at Wembley: Face To Face Tour 2006". HMV . Retrieved 22 December 2007. ↑ "SOLO MEN RULE U.K. MUSIC. WHY?". ↑ Sexton, Paul (13 November 2006). "Westlife, Jamiroquai Assume Control of UK Charts". Billboard charts . Retrieved 22 December 2007. ↑ "Love Westlife?". GMTV. Archived from the original on 23 December 2007. Retrieved 22 December 2007. ↑ "Curtains Up (or Down?) on the Concert Business - NARIP". www.narip.com. ↑ Sexton, Paul (12 November 2007). "Leona Lewis, Westlife Lead UK Charts". Billboard charts . Retrieved 22 December 2007. ↑ "The UK Top 40 Singles". BBC Radio 1 . Retrieved 22 December 2007. ↑ "The Westlife Show Live – Saturday 15 December". Tvthrong.co.uk. 15 December 2007. Retrieved 13 October 2011. ↑ Cardew, Ben. "Spice Girls top UK live league". Music Week. Retrieved 13 October 2011. ↑ "WEMBLEY ARENA – AMERICANA HOTEL LONDON UK – LAST MINUTE BOOKINGS – SPECIAL OFFERS – LONDON EVENTS – REGENTS PARK – DORSET SQUARE". americanahotel.co.uk. ↑ "Croke Park Stadium Venue Information". Croke Park Stadium. Archived from the original on 19 November 2007. Retrieved 15 January 2008. ↑ "10 Years of Westlife Concert". Westlife.com. Archived from the original on 7 December 2007. Retrieved 22 December 2007. ↑ "60 SECONDS: Kian Egan". Metro (Associated Metro Limited). Retrieved 31 March 2008. ↑ Deegan, Gordon. "Cash pile of €3.4m is sweet music to The Script's ears and that's before next year's Croker date". herald.ie. ↑ "Westlife 'Back Home' Tour 2008". Metro Radio. Archived from the original on 12 August 2014. Retrieved 22 December 2007. ↑ Moss, Caz. "Exclusive Westlife Mark Feehily Interview". Female First. Retrieved 22 December 2007. ↑ "Top 100 2009 – UK Music Charts". uk-charts.top-source.info. ↑ Dyke, Peter (21 January 2010). "Simon Cowell to record charity single for Haiti". Daily Star. Retrieved 13 October 2011. ↑ "Westlife announce new album release". Digital Spy. 5 October 2010. Retrieved 13 October 2011. ↑ "Westlife New Album Announcement". Westlife.com. Archived from the original on 9 October 2010. Retrieved 30 September 2010. ↑ "Westlife celebrate chart double". BBC. 7 November 2005. ↑ "Andre named 'hardest working singer' – RTÉ Ten". Raidió Teilifís Éireann. 8 January 2011. Retrieved 13 October 2011. ↑ "Billboard Jan 8 – Mar 26, 2011". ↑ "Westlife Felt 'Unloved' By Cowell". Contactmusic. 13 April 2011. Retrieved 13 October 2011. ↑ "Westlife's Kian falls victim to Twitter hacker". ↑ "Westlife | Egan: 'Mcfadden's Not Rejoining Westlife'". Contactmusic. 18 October 2011. Retrieved 12 November 2011. ↑ "O2 Smart Sounds". O2online.ie. Retrieved 13 October 2011. ↑ "The Wanted, Westlife And Jedward Confirmed For Dublin's Cheerios Childline Concert 2011". Stereoboard.com. 8 August 2011. Retrieved 13 October 2011. ↑ "X-Factor acts most prolific British performers, says PRS". CMU. 8 December 2013. Retrieved 13 December 2013. ↑ "Simon Cowell opens up on Westlife". Pressparty. ↑ Deegan, Gordon (20 August 2011). "Cash at Westlife's firm grows five-fold in 2010". Irish Examiner. Retrieved 13 October 2011. ↑ "Westlife hit the top five in the Irish chart with €35m – Herald.ie". ↑ "Westlife Tickets For May 2012 Farewell Tour Sell-Out After Hysterical Rush For Tickets". Stereoboard.com. 21 October 2011. Retrieved 12 November 2011. ↑ "Westlife to split up" Archived 21 October 2011 at the Wayback Machine . RTÉ Ten. 19 October 2011. ↑ "After 14 Years..." 19 October 2011. Archived from the original on 6 November 2012. Retrieved 13 August 2012. ↑ "Westlife". OCC. 25 October 2011. Retrieved 12 November 2011. ↑ "Official News (GLOBAL) – Statement From". Westlife. 25 October 2011. Archived from the original on 27 October 2011. Retrieved 12 November 2011. ↑ "Statement From Westlife". 25 October 2011. Archived from the original on 1 May 2012. Retrieved 13 August 2012. ↑ "Westlife announce that they are to split". Digitaljournal.com. Retrieved 12 November 2011. ↑ "Lifelong fan Laura Butler on the day the music died as Westlife called it quits", herald.ie, 20 October 2011. ↑ "Westlife – For The Last Time (ITVl)". steveandersonproductions.com. ↑ "Official News (GLOBAL) – The Westlife Show: Live – ITV1". Westlife. 23 October 2011. Archived from the original on 20 November 2011. Retrieved 12 November 2011. ↑ "Fans in shock as Westlife call it a day after 14 years at the top". Herald.ie. Retrieved 12 November 2011. ↑ "Scottish tribute to Westlife's signature bar stool move". ↑ "Westlife sell out show in record breaking time and add date". Music-News.com. 22 June 2012. Retrieved 15 August 2012. ↑ "XL Video supplies LED Screens for Westlife Farewell Concert". Livedesign. 22 July 2012. Retrieved 15 August 2012. ↑ "WESTLIFE – THE FAREWELL CONCERT: Saturday, June 23rd". Westlifecinema.com. 23 June 2012. Retrieved 15 August 2012. ↑ "BBC – Westlife farewell to be screened live in cinemas across the UK, Ireland and mainland Europe – Media Centre". BBC. ↑ "MCD records 'strong' profits". ↑ "JLS announced as Hardest Working Group of 2012". PRS. 3 January 2013. Retrieved 3 January 2013. ↑ "Most Croke Park appearances by people from Sligo. (By Aug 2019)". Twitter. Retrieved 12 February 2019. ↑ Jonze, Tim. "Westlife to split after 14 years". The Guardian (London). 19 October 2011. ↑ "Westlife rule out future comeback tour" Archived 6 November 2011 at the Wayback Machine . Raidió Teilifís Éireann. 4 November 2011. ↑ "Westlife: It's over". Gulf News. 24 October 2011. Retrieved 12 November 2011. ↑ "Westlife deny band rift rumours after split announcement". Digital Spy. 25 October 2011. Retrieved 12 November 2011. ↑ Murphy, Eoin (23 October 2011). "The feuding, fights and fatigue that split Westlife after 14 years at the top". Daily Mail. London. Retrieved 12 November 2011. ↑ "Ruined Shane misses out on €600,000 pay day". ↑ O'Neill, Kara (24 January 2015). "Westlife: Where are they now? From Mark's catering van to Shane's bankruptcy". ↑ "'We don't hang out' Shane Filan talks being neighbours with Kian Egan – EVOKE.ie". 5 November 2015. Archived from the original on 14 February 2018. Retrieved 14 February 2018. ↑ "Westlife Fans, Nicky Just Interviewed Mark on His Radio Show & It's Perfect". 23 November 2017. ↑ "Try To Remain Calm... Westlife Are Reforming!". 4 December 2014. ↑ "Kian Egan denies Westlife reunion rumours". 4 December 2014. ↑ "Westlife's Kian Egan denies reports the band will reform". ↑ "Louis Walsh predicts Westlife comeback". 2 June 2015. ↑ "Louis Walsh Plotting Westlife REUNION". 11 August 2016. ↑ "Legendary 90s boyband set to reunite – but one member will be missing". 13 December 2017. 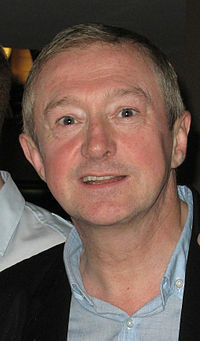 ↑ "Ed Sheeran asked to write songs for Westlife comeback, says Louis Walsh". 21 December 2017. ↑ Agius, Nicola (22 July 2016). "Shane Filan opens up about Westlife reunion addresses X Factor rumours". ↑ "Westlife fans go crazy over rumoured reunion". ↑ "Nicky Byrne Addresses Westlife Reunion Rumours". 17 November 2017. ↑ IANS (18 December 2017). "Westlife reunion not happening, says Mark Feehily". ↑ "Irish pop group Westlife might guest on 'Immortal Song'?". ↑ "Westlife reject €50m to reunite as ex-bandmate 'can't forgive' Brian McFadden". 28 April 2018. ↑ "Westlife respond to claims that Simon Cowell wanted them to reunite with Brian McFadden". Goss.ie. 23 October 2018. ↑ "Westlife reunion 'definitely going ahead' - WITHOUT Brian McFadden - Goss.ie". 23 September 2018. ↑ "Westlife reunion 'definitely happening' but without one original member". 23 September 2018. ↑ "Here's when Westlife are going to bring their reunion tour to Ireland - Her.ie". ↑ "REUNION REVEAL Westlife to officially announce their comeback tonight – confirming new album and Croke Park concert". Irish Sun. ↑ "Westlife Official Instagram of Westlife". Instagram. ↑ "Westlife star Mark says the band is set for a reunion... down at the pub". 1 2 "Westlife". 1883 Magazine. 18 October 2018. Retrieved 18 October 2018. ↑ "'There were only two people who could get Westlife back out of bed in 2018 - Ed Sheeran was one' - Nicky Byrne". Irish Independent. 24 October 2018. Retrieved 24 October 2018. ↑ "CONFIRMED: Westlife are officially getting back together and going on tour". ↑ "Brian McFadden has no reason to keep in touch with Westlife bandmates". ↑ "WORLD EXCLUSIVE! WESTLIFE – FIRST INTERVIEW BACK TOGETHER". 2fm.rte.ie. ↑ "Westlife reveal incredible plans for more concert dates as they insist they're 'not here to just do one show in Croke Park'". rsvplive.ie. 1 2 "Louis Walsh on Westlife, Boyzone, The X Factor and Elf on the Shelf". Irish News. ↑ "ED START Pop superstar Ed Sheeran has written FOUR of the songs on Westlife's return album, manager Louis Walsh reveals". ↑ "Steve Mac: Westlife back with signature sound". Twitter. Retrieved 26 October 2018. ↑ "Ed Sheeran wrote Westlife songs two years BEFORE the band decided to reunite". ↑ "@NickyByrne Another Planning meeting with these lads done.. 2019 is gonna be one hell of a year!". Twitter. Retrieved 26 October 2018. ↑ "daniel.h.davidsen Prince Of Wales The right way to end a session :) #westlife". Instagram. ↑ "peterwallevik Epic moment writing with these guys and #shanefilan #markusfeehily #westlife ". Instagram. ↑ "kianegan So this happened... our first sing song together since we got back together! 2019 will be nothing but Epic! Can't wait for you all to her the new tunes! All coming early 2019!!!! Graham Norton Jan 11 is where it all starts! #westlife #westlifetwenty". Instagram. ↑ "markusmoments Rehearsal time,bring on 2019! ❤️". Instagram. ↑ "January 10th 2019 #HelloMyLove". Instagram. ↑ "The Graham Norton Show lines up an X-Men superhero and an American Horror Story star And Westlife, too. Obviously". Digital Spy. ↑ "The First Graham Norton Of 2019 Features One Of The Most Highly-Anticipated TV Comebacks Of The Decade". lovinmanchester. ↑ "Singapore! Excited for this… we'll see you next week ". Twitter. ↑ "Here we go again  Having just announced two Cardiff dates, that brings the Twenty Tour to 32 shows so far across Ireland & Uk, A brand new album coming after 8years in 2019! But.. it all kicks off on The Graham Norton Show on January 11th 爛@thgnshow @grahnort". Twitter. ↑ "TBC TBC (Artist)". Amazon Australia. ↑ "TBC ウエストライフ". Amazon Japan. ↑ "Westlife - Westlife". Amazon UK. ↑ "Title TBC Westlife". HMV. ↑ "Westlife Official Shop". shop.westlife.com. ↑ "Top Ticketmaster tips to increase your chances of getting Westlife tickets". planetradio.co.uk. ↑ "WESTLIFE ADD 2ND CROKE PARK SHOW DUE TO PHENOMENAL DEMAND!". 18 October 2018. Retrieved 18 October 2018. ↑ "Westlife add dates to The Twenty Tour, get your tickets". list.co.uk. 25 October 2018. Retrieved 25 October 2018. ↑ "Westlife tickets go on sale with extra Glasgow dates added to meet huge demand for boyband's 20th anniversary tour". Daily Record. 25 October 2018. Retrieved 25 October 2018. ↑ "Westlife announce extra UK tour dates for 2019 comeback shows". The Mirror. 25 October 2018. Retrieved 25 October 2018. ↑ "Westlife tickets sell out in less than SIX minutes for comeback tour". evoke.ie. ↑ "Westlife The SSE Hydro, Glasgow". Livenation. ↑ "Extra @westlifemusic! Two new shows have been added to The Twenty Tour in #Cardiff @MotorpointDiff on 1 & 2 July". AXS UK. ↑ "Over One Million Westlife Fans from 122 Countries Wanted to Chat with the Band". GlobalNewsWire. ↑ "WESTLIFE WIN MTV'S BATTLE OF THE BOY BANDS". MTV. 7 May 2012. ↑ "China youth prefer Westlife to politics". MSN. Archived from the original on 2006-07-18. ↑ "One Direction mistaken for Westlife in Africa". 31 January 2013. ↑ Savage, Mark (5 June 2015). "YouTube tool reveals music secrets". BBC. ↑ "50 fastest selling albums ever – NME". 27 April 2011. ↑ "Lonestar's Amazed voted most popular song for wedding first dances". The Daily Telegraph. 29 July 2009. ↑ "Songs by Westlife and Robbie Williams used most at funerals". pressparty. October 15, 2012. ↑ "Westlife Revealed as Popular Music Choice for Funerals". ↑ "Official International Karaoke Charts". Gaon. ↑ "Westlife - Beautiful in White". YouTube. ↑ "Coleen loves Westlife". 28 May 2008. ↑ "Westlife – Shane Filan talks about getting paid £500,000". Daily Mirror. London. 6 October 2014. Retrieved 17 October 2014. 1 2 pommivabrik (15 March 2010). "Westlife and Secret Garden – You Raise Me Up (Nobel Peace Price Concert 2005) HD" – via YouTube. ↑ 2011, BST 20 May (20 May 2011). "The Queen watches Riverdance, Westlife and The Chieftains at Irish music concert". ↑ "Westlife – Biography". Ticketmaster.co.uk. ↑ "PM gets Westlife autographs". BBC. 20 February 2001. ↑ James Bourne (12 November 2018). "@JamesBourne Wondering if Westlife will retaliate now with a music video wearing school uniforms jumping around in the playground with guitars". Twitter. Retrieved 17 November 2018. ↑ "Westlife discography". Discogs. 20 February 2001. ↑ "Reviews and Previews - Spotlight - Westlife - World of Our Own". Billboard. ↑ "Westlife 'Blacklisted' In America". Contactmusic.com. 8 July 2003. Retrieved 15 August 2012. ↑ Taylor, Chuck (5 February 2000). "Dublin's darling Westlife wins over Europe, aims for success in U.S." ProQuest. 112 (6): 110. Retrieved 2 October 2014. ↑ "Westlife confirm split after final Glasgow gig". Entertainment.stv.tv. 19 October 2011. Retrieved 12 November 2011. ↑ "Chris Martin 'dreams' about favourite band Westlife". ↑ "Robert Pattinson: The Lone English Bloke Who Doesn't Know a One Direction Song". Popdust.com. 27 November 2012. ↑ "Elton John Backs Westlife Over Oasis in Album Chart Race". popdirt.com. ↑ "Is the new Calvin Harris song weirdly similar to an old Westlife song?". dailyedge.ie. 19 October 2014. Retrieved 12 November 2014. ↑ "In conversation – 10 things you might not know about Leicester City player Jamie Vardy". Penguin UK. 19 October 2016. Archived from the original on 13 July 2018. Retrieved 12 November 2016. ↑ "Player Playlists: Bradford City defender Matt Kilgallon". Sport Playlist. 19 October 2017. ↑ "Guest Playlist: NCT". Apple Music. 19 October 2017. ↑ "EastEnders star Shona McGarty reveals Lee Ryan's reaction when she told him she preferred Westlife to Blue". Metro. UK. 19 October 2017. Retrieved 12 November 2017. ↑ "Westlife scale new heights with double celebration". The Irish Independent. 19 October 2003. Retrieved 12 November 2003. ↑ "Daniel Bedingfield". The Guardian. 19 October 2003. Retrieved 12 November 2003. ↑ "Lucy Kennedy to cosy up with TV star Gemma Collins on 'Living with Lucy'". ↑ "Leona Lewis meets Westlife on X-Factor.wmv". YouTube. 12 February 2019. Retrieved 12 February 2019. ↑ "Sofie Hagen review – comical confessions of a Westlife obsessive". ↑ "AMAZING FACTS YOU MAY WANT TO KNOW ABOUT SAM MANGUBAT". ↑ "BoybandPH: 6 things to know about the 'Pinoy Boyband Superstar' winners". ↑ "Had on 4music 'every number on if the naughties' before.. Westlife-Unbreakable. I must admit... I air-grabbed". Twitter. ↑ "You won't believe who @CJStander has recently started listening to!". Twitter. ↑ "westlife to unite with mike tyson?". mtv.co.uk. ↑ "Best of Daniel Chan – Daniel Chan – Songs, Reviews, Credits". AllMusic. ↑ "Westlife – Close Lyrics". Muzikum.eu. 1 2 "World records with "Evergreen"". jorgenelofsson.com. ↑ "The Royal Philharmonic Orchestra :: Flying Without Wings [ROYALPHO_SRA-07]". cs.ubc.ca. ↑ "Generic submission: I Cry [Westlife] cover by Shayne Ward – SecondHandSongs". secondhandsongs.com. ↑ "No Regrets – All-4-One – Songs, Reviews, Credits". AllMusic. ↑ "Cover 2 Cover:". Toluna – Opinions for all. ↑ "Stay With Me – EP by Ironik on iTunes". 13 June 2008. ↑ Hung, Steffen. "Resaid – World of Our Own – hitparade.ch". hitparade.ch. ↑ "Original versions of Unbreakable by Mary Byrne – SecondHandSongs". secondhandsongs.com. ↑ News, ABS-CBN. "Manila's 'Combo Tita' ends Youtuber's 'Tawag' reign". ↑ News, ABS-CBN. "Cover artist keeps 'Tawag' win streak alive". ↑ "PressReader.com – Connecting People Through News". pressreader.com. ↑ "Can Mark McKeown impress with his Westlife cover- – Auditions Week 3 – The X Factor 2017 – Video Dailymotion". Dailymotion. 23 September 2017. ↑ "Eminem Slams Westlife After Woopin' Them in the Charts". rapdirt.com. ↑ "Christina Aguilera snubs Westlife – The Mariah Carey Archives". mcarchives.com. ↑ "Westlife: I'm with the brand". 31 May 2004. ↑ "Westlife Attack Pierce Brosnan". ↑ Chu, Jeff (7 May 2001). "Go West, Young Men". Time. ↑ "IT'S ALL TOO MUCH FOR POSH". NME. 19 October 2000. ↑ "MEL GIVES WESTLIFE HELL!". NME. 19 October 2000. ↑ "Westlife's magic lost on Barlow". The Guardian. 19 October 2006. Retrieved 12 November 2006. ↑ "Look back in anger". The Sun. 19 October 2016. Retrieved 14 November 2016. ↑ "Liam lashes out at Westlife hunk". Contact Music. 19 October 2013. Retrieved 14 November 2013. ↑ "Westlife wanted for Jackson song". Skiddle. 30 November 2009. ↑ "Meeting Barack Obama was a 'dream come true' for Westlife boys". ↑ "In Boston, Chinese Pop Star Connects East and West Culture – Massachusetts It's All Here". 29 November 2016. ↑ "REM's Everybody Hurts to be Simon Cowell's charity Haiti single... as stars line up to take part". ↑ "Westlife 'to REUNITE and join new record label after six years WITHOUT Brian McFadden' and launch comeback with song 'written by Ed Sheeran'". ↑ "Westlife - Irish boy band". ↑ "Westlife - Coast to Coast + poster & postcards Korea CD ALBUM (172078)". Eil.com. 29 November 2000. Retrieved 9 February 2012. ↑ "Westlife - Coast to Coast + poster & cards Taiwan CD ALBUM (171142)". Eil.com. 20 November 2000. Retrieved 9 February 2012. ↑ "Pop go the sponsors". ↑ Westlife – Our Story. Amazon UK. ISBN 0007288123. ↑ "Westlife Perfume 3 piece perfume Gift Set". FactorMe.co.uk. Archived from the original on 27 November 2011. Retrieved 13 October 2011. ↑ "WestLife aid poppy appeal". BBC News. 30 October 1999. Retrieved 13 October 2011. ↑ "Westlife support IWS". Galway Independent. 16 April 2008. Archived from the original on 8 October 2008. Retrieved 13 October 2011. ↑ "1 in 4 will need a blood transfusion – Westlife lends support as IBTS launches Blood for Life Week 19–25 September 2004". Giveblood.ie. 25 September 2004. Archived from the original on 4 October 2011. Retrieved 13 October 2011. ↑ "Celebs jet into SA". ↑ pommivabrik (21 December 2009). "Westlife – Us Against The World (Sport Relief 2008) HQ" – via YouTube. ↑ "Media centre". 1 January 1900. ↑ "Castlebar – County Mayo – Westlife Charity Weekend". castlebar.ie. ↑ "Exclusive event with Westlife in aid of The Outward Bound Trust". Eventful. ↑ "Charity auction – VIP Westlife tickets". 3 September 2012. Archived from the original on 3 September 2012. ↑ "Carlton Celebrity Auction". compleatseanbean.com. ↑ "Westlife launch Samaritans' new Sligo text service – Independent.ie". ↑ "Westlife lead stars supporting Christmas appeal at Great Ormond Street". 20 December 2010. ↑ "Jade, 13, gets to meet her Westlife heroes ... thanks to The Star". thestar.co.uk. ↑ "Actor Will Smith and family auction art to help UN feed hungry in Haiti". 8 January 2010. ↑ "Muscle Help Foundation Awarded £10,000 By Big Lottery Fund". ablemagazine.co.uk. ↑ "Shire Health International: First Ever Global Breast Cancer Awareness Campaign Unites Independent Charities from around the World. – Free Online Library". thefreelibrary.com. ↑ "Hot celebs show they're 'Real Men'". 8 August 2011. ↑ "Feehily launches anti-bullying week". 23 April 2012. ↑ "Mark Feehily and Sligo Rovers support Aware". foot.ie. ↑ "GET YOUR MITS ON WESTLIFE KIT!". yorkshireeveningpost.co.uk. ↑ Henderson, Mark. "Charity the winner as Paradise rocks to Larsson's treble". ↑ "Bryan Robson and Paul Merson to play in charity match at Truro". Falmouth Packet. ↑ Lyons, Beverley (25 May 2010). "Westlife stars Shane Filan and Nicky Byrne enjoy training session with Celtic". ↑ "Soccer Aid stars Nicky Byrne and Louis Tomlinson line up for parts in Jamie Vardy movie". 12 June 2016. ↑ "JP McManus hosts lavish star-studded send-off for AP McCoy". The Belfast Telegraph. ↑ "Westlife's Shane will line out against Sligo Rovers". Sligo Today. Archived from the original on 19 February 2018. Retrieved 19 February 2018. ↑ "Exhausted Bryan rejoins Westlife". BBC. Retrieved 2018-11-07. ↑ "Westlife in Sweden". westlife.com. Archived from the original on 2011-08-10. Retrieved 2018-11-07. ↑ May, Annie (2019-03-01). "Westlife Promises To Include Malaysia In Their Twenty Tour". Hype Malaysia. Retrieved 2019-04-03. Wikimedia Commons has media related to Westlife .